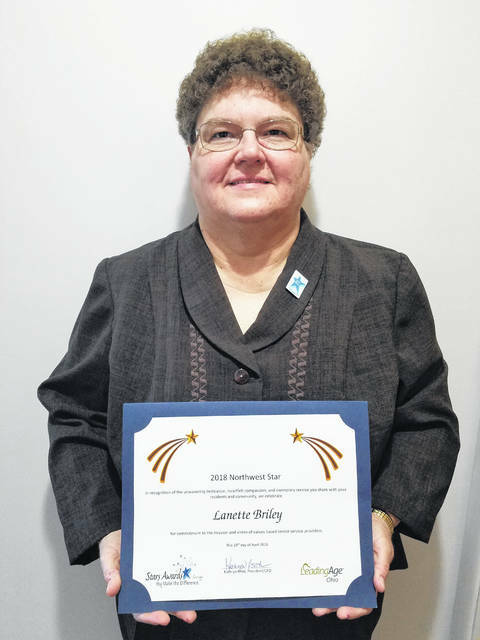 LIMA — A service coordinator at Luther Pines was recently presented a STAR Award certificate and STAR pin at the LeadingAge Ohio banquet at the Fairhaven Retirement Community. Lanette Briley, was nominated by her supervisor because of her dedication to the residents of Luther Pines. According to her supervisor, she is always willing to assist residents to ensure that the residents are able to remain at home as long as possible. Her supervisor also said that she is willing to help her co-workers, does well with problem solving, takes pride in her work, is always cheerful and her happiness is contagious. The LeadingAge Ohio STARS program recognizes employees and organizations that represent excellence in aging services leadership, make outstanding contributions to the field, and are models of quality and innovation.